Flint Expatriates: Should I Stay or Should I Go? 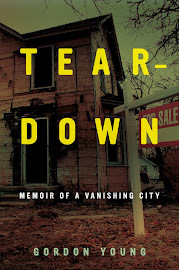 Writer Jan Worth-Nelson has the uncanny ability to capture the contradictions of life in Flint. I was reminded of this when I read two of her recent columns in East Village Magazine. In one column she reflects on a theme that all Flint residents have wrestled with at one point or another: what would my life be like if I lived somewhere else? Most of us veteran Flintoids, especially those of us who came from somewhere else and thus can only regard our lives here as a matter of "choice," go through phases of exasperation and regret. We all have our Flint sweet spots, griefs and vindications. We make them, we find them and we cherish them with recurring dollops of hope. The other afternoon a couple of friends and I were on our way to 501 Grille when we spied two drummers at the corner of Saginaw and First streets under the terra cotta American eagles of what used to be First National Bank. From a distance it sounded like amateur auditions for a Fourth of July parade but it was only late April. Still I admit there was something pleasantly odd and rousing about it. Hmm ... drumming on street corners. My friends and I considered. Is this a good thing? Or is this something worrisomely earnest, like awkwardly hopeful murals sprouting up on abandoned walls? Since we were in an optimistic mood anticipating our first glass of wine of the day, we decided it was a good sign. Buskers, we've got buskers, just like Washington Square Park in New York, Dupont Circle in D.C., and Ghirardelli Square in San Francisco. Flint is a complicated place, and it's good to know there are writers working to capture the nuance of a city that is often dismissed as nothing more than an economic catastrophe. What, no comments? Doesn't anybody else have any views on these matters? Hey, don't take it too hard. The posts that get the most comment are pure nostalgia. The more thoughtful items don't seem to generate a lot of discussion. Not sure why. Having lived in Flint, left, then came back, I could really relate to your story. I think about the "what if's" every day. I believe the in zen/positive thinking approach that you make a place good or bad with your own attitude, but that really gets put to the test in Flint. I like to think about the friends I have here.They are what counts, and I've done well in that regard in Flint. Now if I could transplant those friends and relationships to Paris or something, I still might do it. Perhaps it's a sign of a spectrum of talent returning to Flint.